As adults, all we ever wanted to see for the younger generation is to be happy. We try. Hard. We provide them with plenty of love, faith, hope, affection, play, safety nets, education, good manners, teach them how to say thank you, be grateful for what they have and much more. We are there to kiss their “booboos” should they trip, fall and scrape their knees and hands. Endless days and nights to be present for their school shows, sports league, and graduation to cheer them. A shoulder to cry on when they experience their first broken love affair. And then they grow up from all these experiences, learn from them and become resilient in life. As much as we want to be there all the time, we can’t. So for now, we enjoy their innocence. 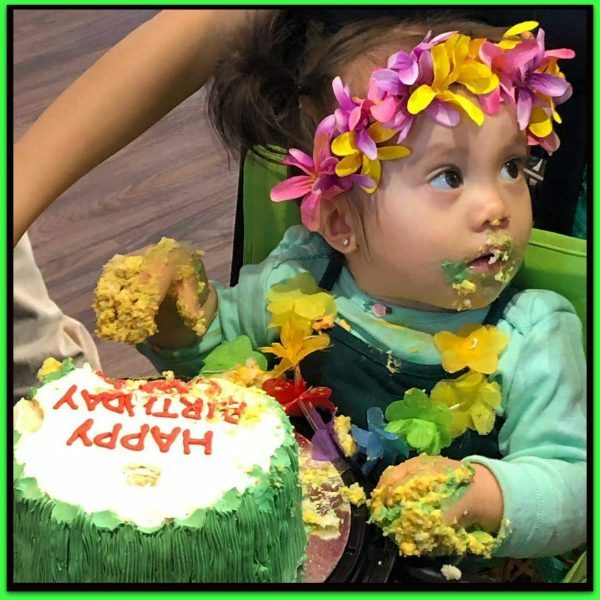 My grand-niece celebrated her first birthday party, Luau style. By the time we arrived at the party, it was over. Better late than never, happy to be driven by my younger brother even though he had a full day’s work and thankful for that. This is my one photo taken of her sleeping peacefully wearing the knitted hat I brought for her birthday present. Photos of the party started appearing. Where else? On Facebook! Here she is having her own cake and eating it, too! Who do you think is having a grand time watching her dip two hands on the cake. Who do you think shouting and egging her … GO-go-Go … Dig in … Good job, Layla! Not me. I wasn’t there. This entry was posted in Family and tagged #timesquare, Birthday, Happiness, Lens-Artists, Reflection, Time by Perpetua. Bookmark the permalink. All these preparations for Layla’s 1st year old party! Adults had more fun and good memories for years to come for Our Layla Pie❤️. Celebrating first year is a thankful year that all was well for the child and parents- until adolescence years begins and parents are in for an awakening. Kids- love them all . Too funny to make all this fuss on the kids first birthday party. You guys did a good job for the children the as well. Good to see all those pics. Sorry to have missed the grand event. So true, Joanne. Adults tend to regress to the level of a baby or lower 😛 Just listening to them makes me wonder what they are actually doing. I can only imagine. The first birthday cake is such a treasured ritual. Thank you V.J. It’s a must to have the first cake. This is for her only and there was another big cake for everyone.